What is the best way to track my Google rankings for multiple keywords? 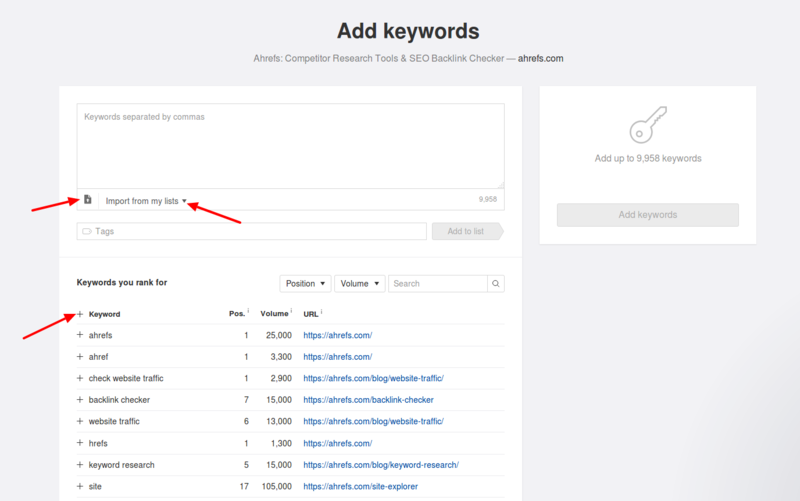 With Ahrefs Rank Tracker, you can track up to 10,000 keywords in different locations. It allows you to see changes in your SERP positions right from our web interface as well as via regular email reports. Add keywords from the list of suggested. Users of the Agency and the Advanced plans can track up to 10,000 and 4,000 keywords correspondingly and get daily updates on them. The Standard Plan allows our clients to see updates of up to 1,000 keywords every three days. And the Lite Plan provides weekly updates for 300 tracked keywords max. To add keywords into Rank Tracker to an existing project, read this.